We love hearing about great events that showcase great products, help people transform their lives or assist in career transition. If you're looking for an IWD event to go to, consider this one! Nova for Women and Children are holding a special IWD Breakfast at the beautiful Merewether Surfhouse in Newcastle NSW. The Breakfast will be a morning full of fun and lively conversations, with three experienced and inspirational women who will share their professional stories with us. Self Serve Tea, Coffee, Juice and a selection of Fresh Fruits on arrival. Delicious Hot Breakfast served upon seating, with Tea, Coffee and Juice throughout. Fun, Inspirational and Entertaining conversations with our Special Guest Speakers, along with an opportunity to interact and ask questions. There will be IWD Pledges and Photo's on the day, as well as the opportunity to mix and mingle with like minded people on this special day, - all while overlooking the beach. What better way to start your International Women's Day! Join us, as we Celebrate Amazing Women and this years IWD theme of Balance for Better. Click here to view or purchase now. Do you have an idea that you believe could become a successful business? Are you interested in being an entrepreneur or starting your own business? Do you want to meet like-minded women from your area? To celebrate Women's Week 2019 the Minister for Women, Tanya Davies, will host a free forum for business women living and working in the western suburbs of Sydney. The forum will aim to raise awareness, promote conversation as well as supply tools and advice from successful entrepreneurs and business women to a female audience. The event is free to the public and will include a catered networking session. All welcome. 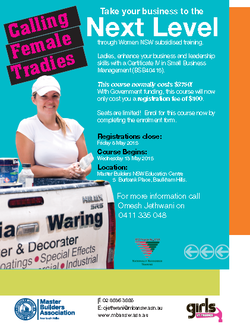 Ladies, enhance your business and leadership skills with a Certificate IV in Small Business Management (BSB40415). This course normally costs $3750! With Government funding, this course will only cost you a registration fee of $100. Enrol for this course now by completing the enrollment form. Location: Usually at the Master Builders NSW Education Centre, in Baulkham Hills. The ecoSHOWCASE - is a Green Building Roadshow, featuring genuine Enviro friendly products for sustainable solutions. The Women of the Year Awards recognises the outstanding contributions of Women in NSW & celebrates their significant achievements.